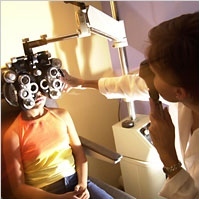 Optometrists provide a full scope of eye care. Welcome to the Nevada Optometric Association (NOA) website. Whether you are a patient looking for a doctor or information on eye care, or a doctor looking for information on the association, we hope that you can find what you need here. The Nevada Optometric Association represents optometrists throughout the great state of Nevada from large metropolitan areas to small towns. Every member of the association holds to the highest ideals in the delivery of eye care to the public. Optometrists provide a full scope of eye care, from comprehensive eye exams and glasses or contact lenses to the treatment of eye diseases such as eye infections and glaucoma. Members of the NOA are actively involved in projects that benefit the community such as: helping to train school nurses to screen for eye and vision problems, and helping children and parents to understand the importance of eye safety. Many members of the NOA are participating in the InfantSEE® program that provides the first eye exam to infants in order to detect vision and sometimes even life threatening conditions. Membership in the NOA shows a commitment to the profession of optometry and to the public that we serve.